Fatmir Terziu an Albanian writer, critic, journalist and filmmaker. 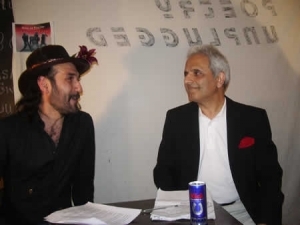 Some of the books he published are: Don’t Silence (Mos Hesht) poetry 2000; Walking on Glass (Ecje ne Qelq), poetry 2006; The Argadas Devil (Djalli i Argadasit) short stories 2005; The Mysterious Woman (Misteriozja), short stories 2009; A Different Critique: An Insight Into Albanian Poetry and Prose; Media, Technology and Everyday Life, etc. 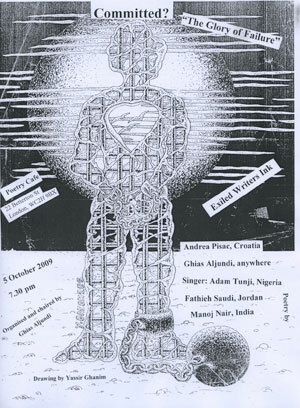 Arta Dedaj from Prishtina (Kosova), poet and lawyer, has had her poems published in various literary magazines and papers in Kosova and also in London in “Sharing the Pain” in 1999. She did the Albanian/English translation for the BBC1 Everyman documentary programme “Whose Home is it Anyway” in 1993 and was also published in “Homes and Gardens” exhibition catalogue by Melanie Friend in 1996. Elizabeth Gowing is a writer of non-fiction books, journalism and poetry. Land of Blood and Honey; my journey to become a beekeeper in Kosova was completed last year. She is now working on Edith and I, a book narrating travels in the footsteps of Edith Durham through London, Kosova and Albania. Her poems have been published in over thirty magazines and anthologies including Staple, Poetry Nottingham International, Ambit, The New Writer and Orbis, as well as being read on the BBC World Service’s Poems by Post. Robert Wilton, writer and consultant, advisor to two Kosova Prime Ministers in the lead-up to independence, has had his short stories widely-published, along with translations from Albanian. He now divides his time between London, Cornwall and Kosova, focusing, amongst others, on an historical novel. The evening will be accompanied by Albanian folk music by Eliza and Mirdita Dedgjonaj. The evening, to be held on Monday December 7th will also be marking the 10th anniversary of the foundation of Exiled Writers Ink with members talking about their memories of the successful ten years. Hanan Al-Shaykh is a Lebanese novelist, short-story writer, and playwright, one of the leading contemporary women writers in the Arab world. Her stories deal with women’s role in society, the relationship between the sexes, and the institution of marriage. Her novels have been translated into English, French, Dutch, German, Danish, Italian, Korean, Spanish, and Polish. Ghalia Kabbani is a Syrian writer. She spent her childhood in Kuwait, leaving after the invasion in 1990. She has worked as a journalist since 1979. In 1992 she published a volume of short stories and in 1998 her first novel, The Mirror of Summer, in Cairo. Her second collection of short stories was published in 2003, and her third in 2005. 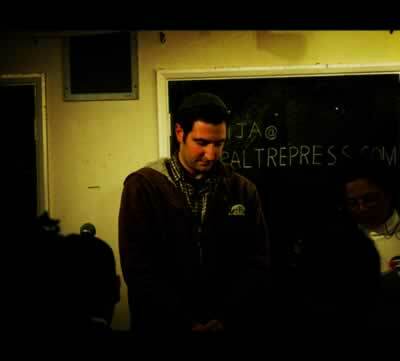 Hosted by poet: Fathieh Saudi. Kurdish poet and journalist; he writes in Turkish. He was born in a Kurdish town, Batman, in the east of Turkey. He is a sociology graduate of Ankara Hacettepe University. His poems and essays were published in various well known Turkish literature periodicals including Varlik, Defter, Sonra Edebiyat, Kunduz Dusleri and Kavram Karmasa. He won the 1998 Poetry Award of Human Rights Association for his five poems. His first poetry book, titled Suskun Kavallar Medresesi (Madrasa of Silent Reedpipes), was published in 2004. He moved to London in 2005. He is an editor of a Kurdish/Turkish London weekly paper. Ms Durmush has nine books under her belt. She started to paint when she was mugged and since then has gained a first degree and a Masters in Art. Durmush is good at many things from cooking to art, poetry, short stories and plays. Sevim Gorgu was born in Eastern Turkey and has lived in the UK since 1990. She is a short story writer and poet and also a Turkish classical music singer who performed with “Group Nihavend” for several years. Aydin Mehmet Ali was born in Cyprus. She is an award-winning author and her short stories have appeared in various anthologies and journals, including Silver Throat of the Moon: Writing in Exile. 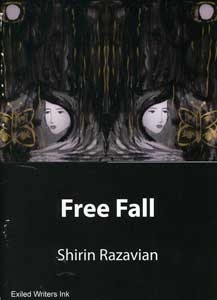 Her first short story collection was entitled Pink Butterflies/Bize Dair (2005). She is also an international education consultant, project manager and researcher. 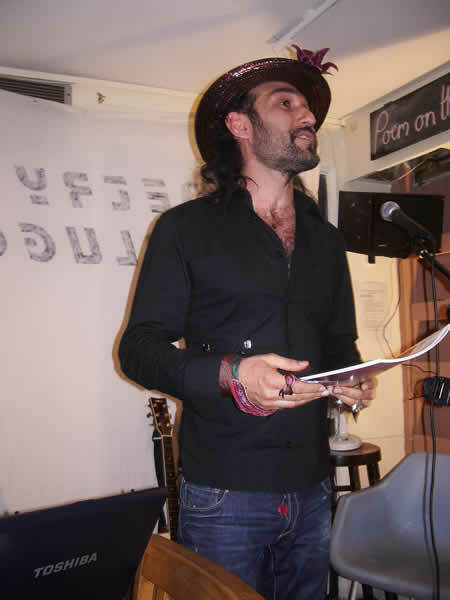 Adnan Al-Sayegh: On several occasions, international award-winning poet, Adnan Al-Sayegh’s life has been threatened as a result of his powerful readings in his native Iraq. Forced into exile by militia disturbed by his critical irreverence, his poetry sweeps all of life up into a linguistic call to artistic arms. Gareeb Iskander: Journalist and poet, Gareeb Iskander pursues his dreams of Baghdad through the mists of London, illustrating his work with poetic themes such as the sea, exile, life and sadness. 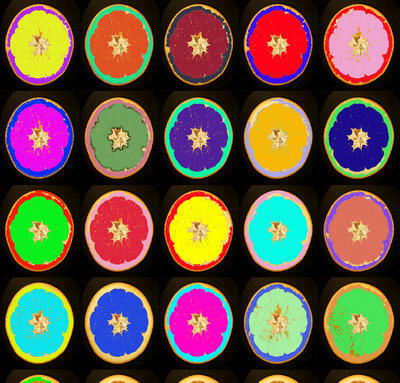 He uses both ancient Iraqi and contemporary international symbols evocatively. Maria Jastrzebska: born in Warsaw, lives in Brighton. Her collections include Postcards from Poland, Home from Home, Syrena and I’ll be back before you know it. She was co-editor of Forum Polek, a bilingual anthology of women’s writing, Poetry South and Whoosh. Her work has been widely translated. Shirin Razavian’s fourth publication, Which Shade of Blue is currently being published in London. She fled Iran due to censorship and in the UK continues to write politically astute poetry, remaining resolute in her pursuit of human rights. 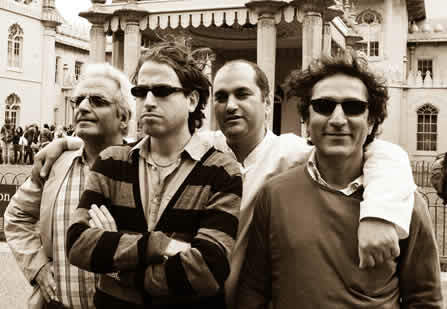 Music: Gadjo Form: Polish Band: These unsigned gems burst onto the folk scene with melodic effervescence in 2008. Listing Roman, Bulgarian, Ukrainian, Polish, Macedonian and Hindu folk music as inspiration, Gadjo Form’s style is full of energy and poignancy. Zuza, Greg and Darek deliver stunning sounds. SRI LANKAN AND TAMIL VOICES – What Now? Talks, readings and discussions from renowned and award winning Sri Lankan poets and novelists: their response through prose and verse to the violence and the clampdown on freedom of expression in Sri Lanka. ROHINI HENSMAN, author of the novel Playing Lions and Tigers, shortlisted for the Gratiaen Prize (2002), and To Do Something Beautiful. Active in the labour and women’s liberation movements, and anti-war campaigns and struggles against the oppression of religious and ethnic minorities in India and Sri Lanka. SIVAMOHAN SUMATHY, award winning playwright, poet, writer and film maker, author of In the Shadow of the Gun. Performed nationally and internationally her theatre of risk, and received critical acclaim for her two short films, Piralayam (Upheaval) and Oranges. Teaches at the University of Peradeniya, Sri Lanka. Her sister, Nirmala, will read from her poetry. LAKSHMI HOLMSTROM, writer and translator, past Fellow at University of East Anglia. Author of Silappadikaram and Manimekalai, her re-telling of the fifth-century Tamil narrative poems, editor of The Inner Courtyard: Short Stories by Indian Women, and recipient of India’s Crossword Book Award. She will read from her translations of Sri Lankan and Tamil poets, R. Cheran, S. Sivaramani and others. Risk of Poetry delivers a collage of poetry, literary theory, imagery, fantasy, voices, music, exile, before and long after, by London S-kool – an avant guarde band of multi-lingual poets and critics, who aim to create poetry and text from hybridisation of languages, genres and lifestyles in order to endanger the tranquillity of norms and shake up the standards of the literary genre, bringing together Ali Abdolrezaei, Parham Shahrjerdi, Abol Froushan, Mansor Pooyan, to propose the new directions in the Risk. 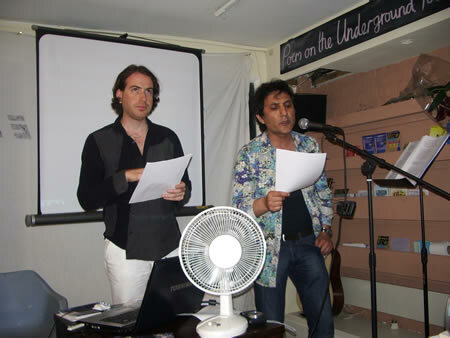 Their aim is a globalisation of poetry through literary exchange between English, Persian, French, etc. (7 languages in the latest issue of poetrymag.info) in a context of post exile, through translation and analysis. Osamah Al-Tamimy is 21 years old and is originally from Iraq. He spent only a few months there due to the instability in his home country, particularly the hardships and deprivation of daily life resulting from the United Nations sanctions regime imposed by the US and Britain. His play, ‘Arab in the West’ was inspired by his own life and experiences. It aims to challenge prejudicial assumptions about Arabs and especially, about young Muslim men, in a climate of hostility and suspicion. ‘Arab in the West’ was performed to critical acclaim in five locations in 2008 including Sloane Square and Ladbroke Grove, London, as part of the Royal Court Theatre’s programme, ‘Unheard Voices’ and ‘Across the Street, Around the World’, organised by the Royal Borough of Kensington and Chelsea. Sahra Mohammed was born in 1987 in Somalia and came to the UK when she was five years old, fleeing the civil war with her family. She had no schooling in Somalia and feels most comfortable writing in English (the language of her education). 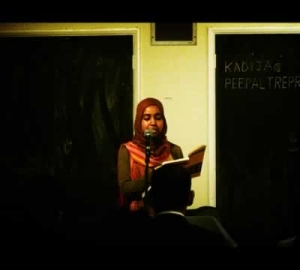 She writes mainly about things that affect her socially and about Somalia. She says “I’m no great activist but I find myself drawn to causes and I have real empathy with anyone who may have experienced war first hand or anyone who’s families may have been involved in wars or struggles.” Sahra writes poetry which recently won her a place on a prestigious Arvon Foundation course. Sahra sees herself as fitting in with the longstanding Somali tradition of storytelling and is currently working on short stories. Abdi Bahdon is a gifted 18-year-old poet, lyricist and actor who was born in Somalia. He has starred in a film entitled Mash Up, the ITV series The Bill and a theatre production entitled Ghetto Faces. Abdi faced appalling violence in Somalia and was left with a paralysed arm and broken ribs after being caught up in a car explosion. He lost his family and friends when he fled to the UK with a group of refugees, who later abandoned him. Abdi is currently studying A levels in Sociology, Physiology and English. Abdi’s writing is inspired by his horrific experiences and by the hardship and pain faced by people in his homeland. His poignant poems appear in Silent Voices. Mohammed, studied Buddhism, then converted to Islam following an eye-opening trip to Gambia where he was touched by the peace and unity of the beautiful people he met there. Produced and performed by Daniel and Mohammed, is a fusion of Islamic and Jewish words and music with jazz, blues, reggae, funk and hip hop, carrying a strong Universalist message of peace and unity which appeals as much to those of other and no faiths as to devout (and non!) Muslims and Jews. Accordion from Colombia by Flakito. Isabel Ross Lopes: music and poetry from her experiences as a migrant and diasporic spanish music and voice. 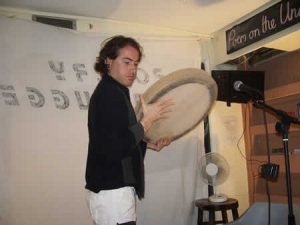 Dante Concha: enchanting panpipes and history of the magical pipes from Peru. A cultural migrant from Texas, Amy Corzine is a poet, writer, editor and teacher. Her poems have been published in ‘Kindred Spirit’, ‘The Delhi-London Quarterly’, ‘Caduceus’ and literary magazines. She hopes her new book entitled The Secret Life of the Universe: The Quest for the Soul of Science (Watkins, UK, 2008) will inspire people to return to the ecological, nature-centric view our technology-based world has left behind. She aims to explore psychospiritual realms further, from which she believes all great works of poetry and fiction come. She has also produced a graphic novel adaptation for Jane Eyre and a family travel guide Take the Kids: Ireland. Barbara Marsh is a London-based American poet, singer and musician, and half of former Anglo-American indie/folk duo ‘The Dear Janes’. Her poems have appeared in UK print/online magazines including Magma and The Interpreter’s House and Limelight; and anthologies, including Four Caves of the Heart (Second Light Publications) and Gobby Deegan’s Riposte (Donut Press). As a singer/musician/writer, she was one-half of ‘The Dear Janes’ and continues to work in various projects, currently as part of the band Vachement Bath.